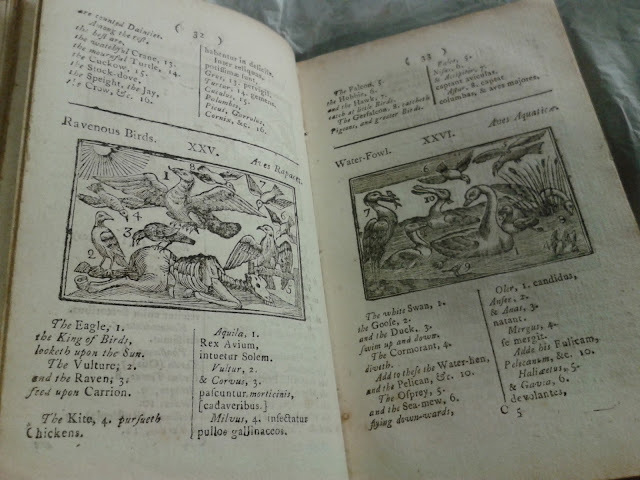 Visiting a warehouse of books may not sound particularly exciting however, Collections Officer, Paula Wride, who hosted the visit, had taken great care to select and display items which represent the range, scope and purpose of the book and archive collections. 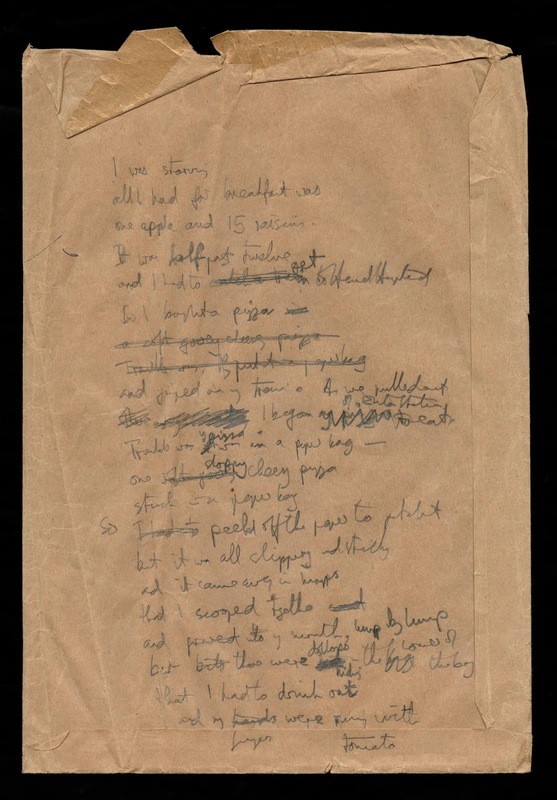 As well as books, she included examples of hand-written notes and notebooks, typed manuscripts annotated with amendments (or comments and doodles), story-boards, sketches, engravings and water-colours. These demonstrated some of the creative processes and stages, authors (including Enid Blyton, David Almond, Philip Pullman, Martin Waddell, and Katherine Holabird), illustrators (including Helen Craig, Faith Jaques, Polly Dunbar, Barbara Firth, Edward Ardizzone, and John Lawrence) and publishers work through, and the challenges of effectively conserving and storing different formats. Correspondence between authors and publishers provided an insight into the formal nature of communications in the past, and prompted discussion on the less formal and more ephemeral nature of communication that email generates. 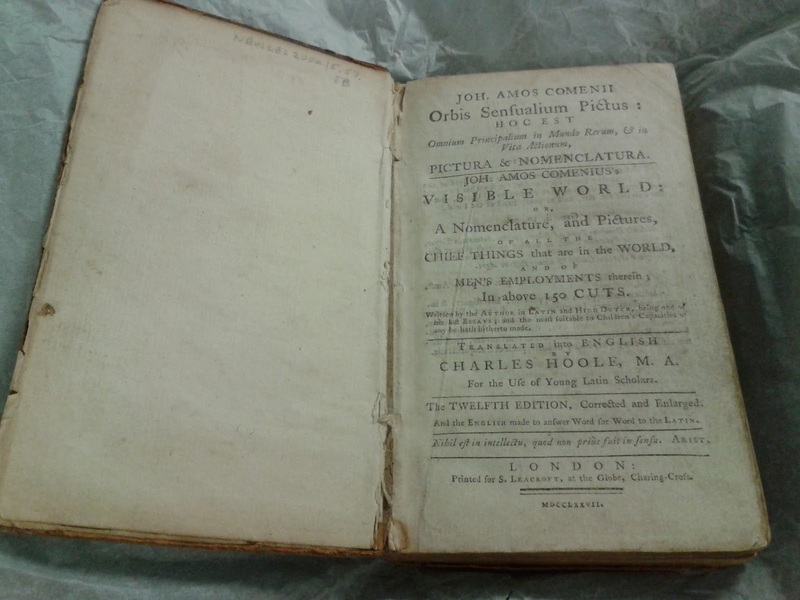 Although the collecting policy focuses on children’s literature and illustration from 1930 onwards, earlier books are kept in the context of specific archives donated to the collection, and include a copy of one of the earliest children’s books, (Comenius’ Orbis Sensualism Pictus or Visible World in pictures, written in Latin and English) in its 12th edition published in 1777. Beth, our Learning and Participation Coordinator at Seven Stories, explains why #archivesrock. She uses our collections to inspire children to love books, to love writing and drawing, and to feel confident to create. As Learning and Participation Coordinator, using material from the Seven Stories archive is my favourite part of my job! Although we hold some sumptuous final illustrations and masterfully crafted typescripts in our archive, for me the magic of our collection material is that a lot of it ISN’T perfect. 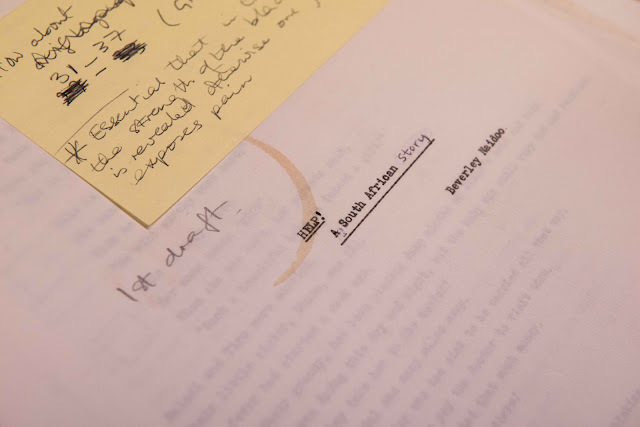 Because Seven Stories collects all items relating to the process of creating a book, our Collection Team treats scribbles, crumpled research articles, notes, scruffy sketches, incomplete letters and coffee-stained manuscripts from authors and illustrators with just as much special care as their final printed books. 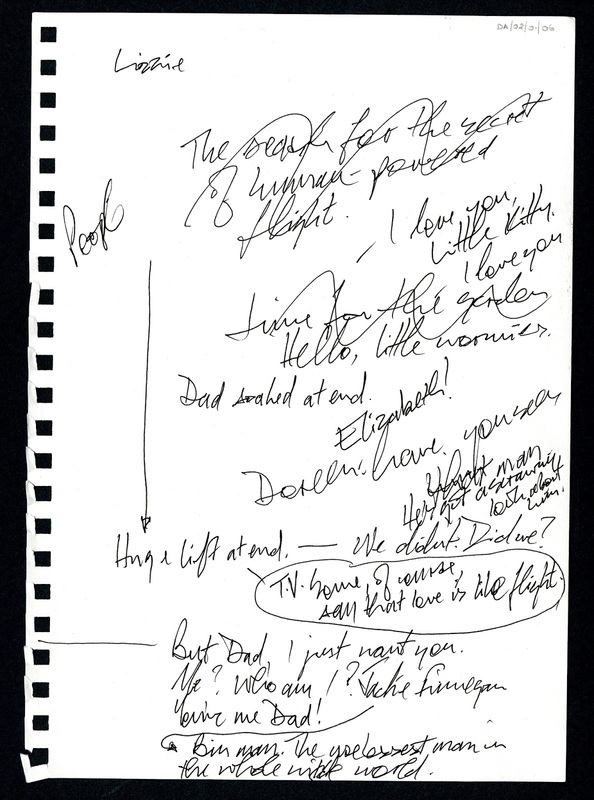 DA/02/01/06 - Manuscript notes on the plot, characters and setting for 'My Dad's a Birdman' by David Almond. ©Seven Stories, The National Centre for Children's Books. One of my highlights has been sharing David Almond notes and Polly Dunbar’s artwork for My Dad’s a Birdman with teachers. When education professionals see the ‘mess’ that goes into creating a seemingly perfect finished book, they often have a lightbulb moment about how to approach creative writing or arts activities with their classes. I remember one teacher saying during a professional development session - “we’ve been teaching it all wrong, haven’t we?” I think she meant that there can be too much expectation on children and young people to create something that is perfect first time, when actually the true creative process is surprising & full of tangles along the way! Photograph ©Seven Stories, The National Centre for Children's Books. However, the best reactions often come from children and young people themselves. During one partnership project, we used Michael Rosen’s notes and scribbles to inspire children in their own creative writing. When they saw that he had jotted down funny poem ideas on the backs of torn envelopes and letters from his child’s school, it opened their eyes to the real lives of writers and changed their perception of what ‘proper’ writing is. In that way, the archive material helps children to see that being a confident writer is achievable and that there is no right or wrong way to approach writing for pleasure. MR/01/08 - Draft material by Micheal Rosen relating to various poems first published in 'The Hypnotiser' in 1988. ©Seven Stories, The National Centre for Children's Books. Pictures created when illustrators were children can also be hugely inspiring. Judith Kerr’s childhood drawings from her time as a refugee during WWII, which were carefully protected by her mother during the years that the family travelled through Europe, are a perfect example of this – when children see the pictures it is as though they have a window into Judith’s life. They can see that she is not an untouchable celebrity but a warm human being, who was once 11 years old and interested in drawing exactly the kind of things that they are interested in. The fact that these original children’s drawings are so many years old makes the children gasp, but so does the fact that they are considered to be special enough to be framed in a gallery. It’s a powerful realisation. The 11-year-old children have a new confidence when later on we ask them to create their own illustrations telling the story of their own life. 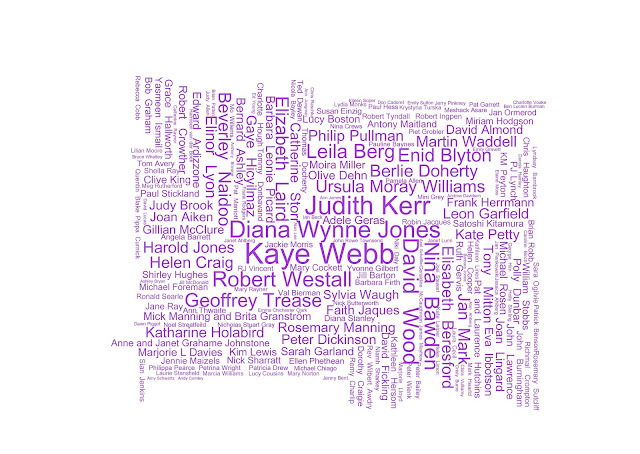 Inspired by Judith Kerr. Photograph ©Seven Stories, The National Centre for Children's Books. Photograph ©Damien Wootten for Seven Stories, The National Centre for Children's Books. It’s an important question, and we listen carefully to their answers, because (if they make enough mistakes, and keep their notes and sketches safe)…who’s to say that they won’t? Explore our archives and join in the #exploreachives conversation. Join us on Twitter, and Instagram using the handle @7stories and on Facebook by searching for 'Seven Stories, National Centre for Children's Books'. All this week, Seven Stories is celebrating our amazing archive as part of the campaign run by The National Archives - 'Explore Your Archive'. Each day will see a new theme and hashtag encouraging archives to open up online, and everyone should look forward to finding out new and exciting gems that don't often get shown off! Today's theme is celebrating what archives have achieved in the past year. We have had a fantastic time over the past 12 months, so we are delighted to share this with you all. 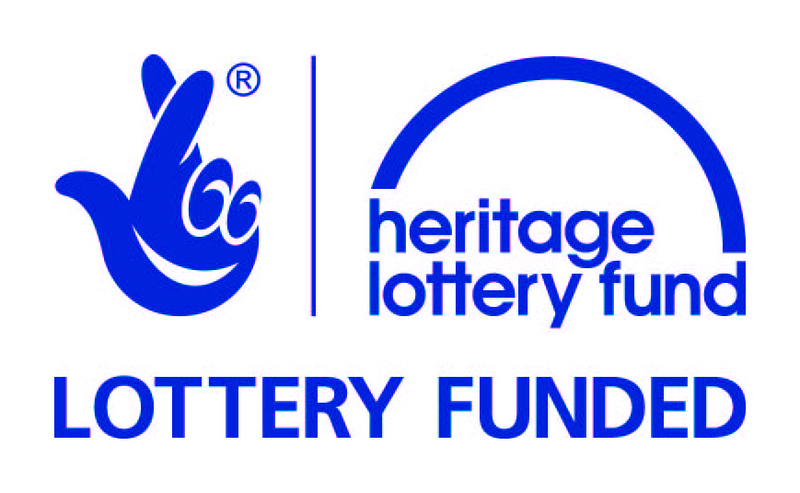 November 2014 - Seven Stories was awarded £341,500 by the Heritage Lottery Fund's Collecting Cultures programme. This enables the acquisition and transport of new material, broadening and deepening the overall Collection, and also supports cataloguing and making this material accessible to the public. Find out more here. November 2014 - Donation of the Clive King Collection. It includes manuscripts of published and unpublished works, letters from publishers and agents, selection of fan mail, copies of published books, scripts of films and plays, draft electronic typescripts stored on floppy disks. Photograph taken by Damien Wootten for Seven Stories. 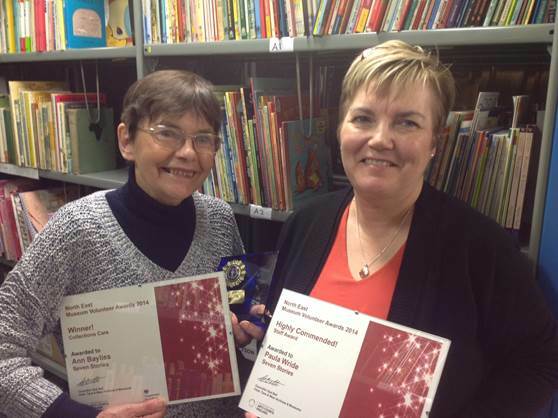 December 2014 - Awards won by our volunteers and staff in the North East Museum Volunteers Awards 2014. Ann Bayliss [left] won for ‘Contribution to Collection Care Award’, and Paula Wride [right] was Highly Commended in the ‘Contribution to Supporting Volunteers’ category. These two have been working and volunteering for Seven Stories for many many years, and it was wonderful to see them celebrated. January 2015 - Donation of the David Fickling Collection. This comprises material relating to the career of David Fickling and the establishment and operations of David Fickling Books. It includes edited manuscripts by many of the authors David has worked with as well as correspondence. February 2015 - Donation of the Beverley Naidoo Collection. The archive includes material relating to her published novels, short stories and anthologies, draft material and correspondence, as well as her non fiction titles and research into equality, diversity and multiculturalism in children's literature. The collection also includes educational resources, fan mail and responses to Beverley's work. Photograph taken by Damien Wootten for Seven Stories. February 2015 - Arrival of the Paul Stickland Collection. A fantastic new collection of artwork for Paul's well known book Dinosaur Roar, arrived at Seven Stories in February. We are delighted to have this artwork in the Collection, and it complemented Paul's fantastic residency in the Seven Stories visitor centre in Summer 2014. 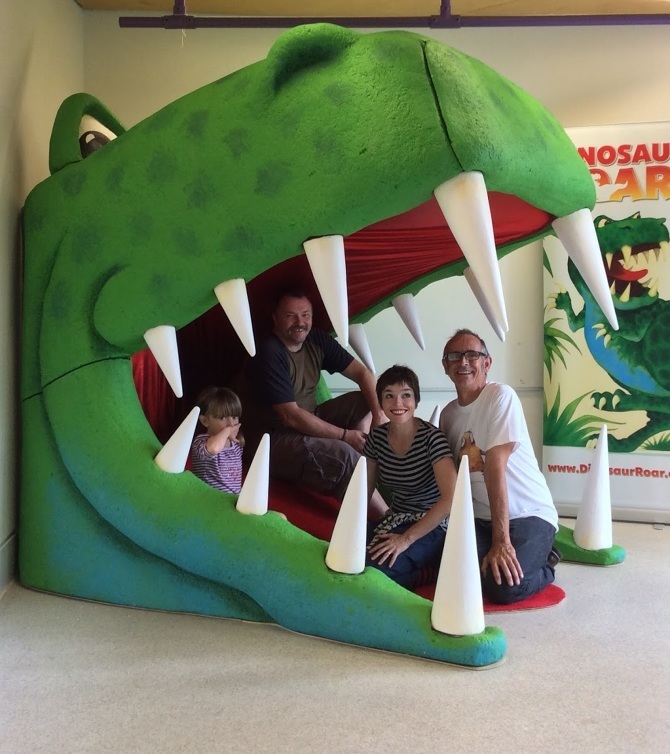 Paul built this fantastic dinosaur head to be used in the visitor centre, and it was certainly well loved! The photo shown here is from Paul's website, have a look at what he is up to by clicking here. February 2015 - Donation of Bernard Ashley Collection. Papers relating to Ashley's career as a writer for children, including manuscripts, correspondence and other papers. This is an accrual to our existing Ashley holdings, he also donated the annotated typescript for The Trouble with Donovan Croft in 2005. 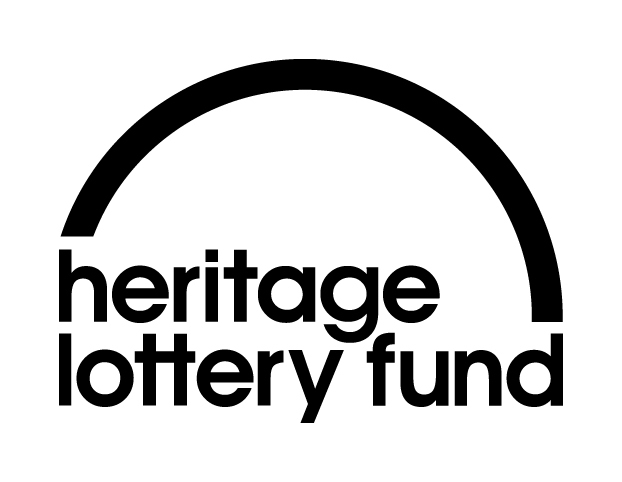 February 2015 - As part of the Heritage Lottery Funding for Collecting Cultures, a new post was created. 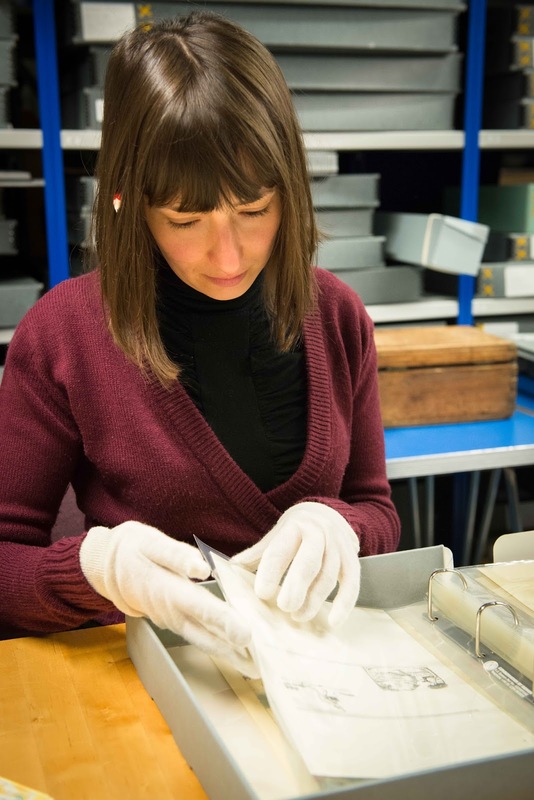 This is Danielle McAloon, our Collections and Exhibitions Assistant. She works extensively on the archive and book collections, and her name will probably be familiar to habitual blog readers! ©Seven Stories, The National Centre for Children's Books. April 2015 - Donation of the Elisabeth Beresford Collection. Affectionately known in the office as being divided between 'Wombles' and 'Not Wombles' (our favourite archival category!). This substantial collection includes extensive material relating to Beresford's best-known creation 'The Wombles', including manuscripts, merchandise, correspondence relating to publications and adaptations, books, and various ephemera. The collection also includes material relating to Beresford's numerous other titles for children, her titles for adults, and her early career. April 2015 - Donation of the Michael Morpurgo Collection. Several months before donation of the material was made public, our Collections and Exhibtions Director, Archivist, Marketing Assistant and Chief Executive made the long journey down to Devon to pick up the archive. The photo shows Morpurgo signing the paperwork to hand over his papers. April 2015 - Purchase of Barbara Firth Collection. 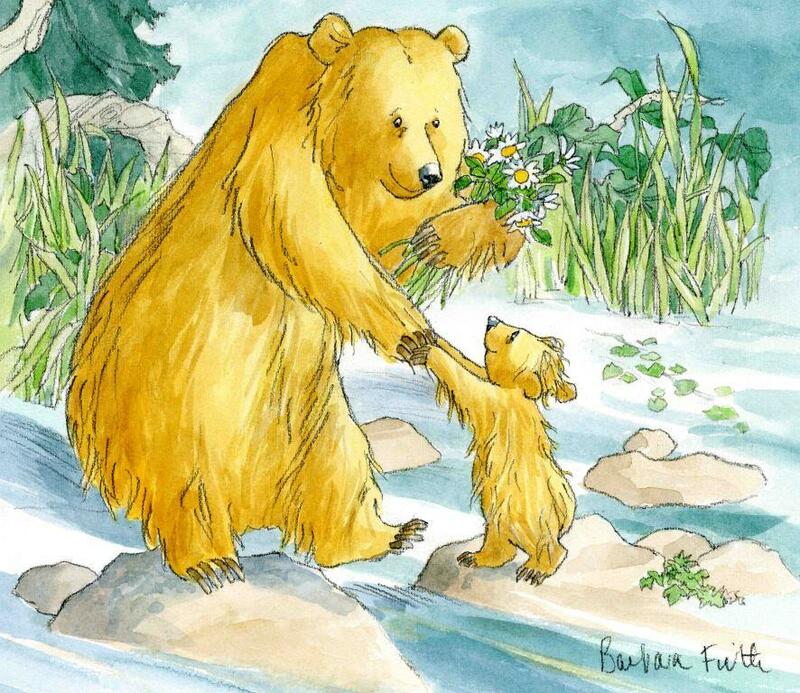 This wonderful acquisition consists of original published artwork comprising a complete suite of cover and internal illustrations for the award winning Can't You Sleep Little Bear, plus front and back cover illustrations for the paperback version and one single sheet of original lettering (by Liz Wood of Walker Books). There is also preliminary work retained by Barbara Firth, including pencil drawings and sketches, a copy of the manuscript, photos and postcards of bears and supplementary archive material from Walker Books. 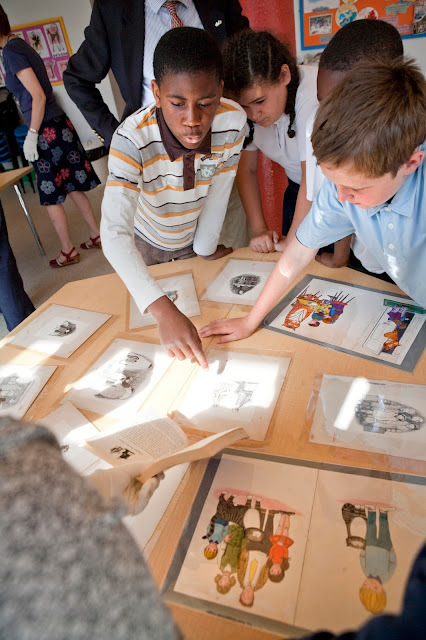 May - June 2015 - Some very lucky year 8 students from Shotten Hall in Durham worked on our new Beverley Naidoo archive, creating a new drama based on her book Journey to Jo'burg, and even got to present the play to the author herself! 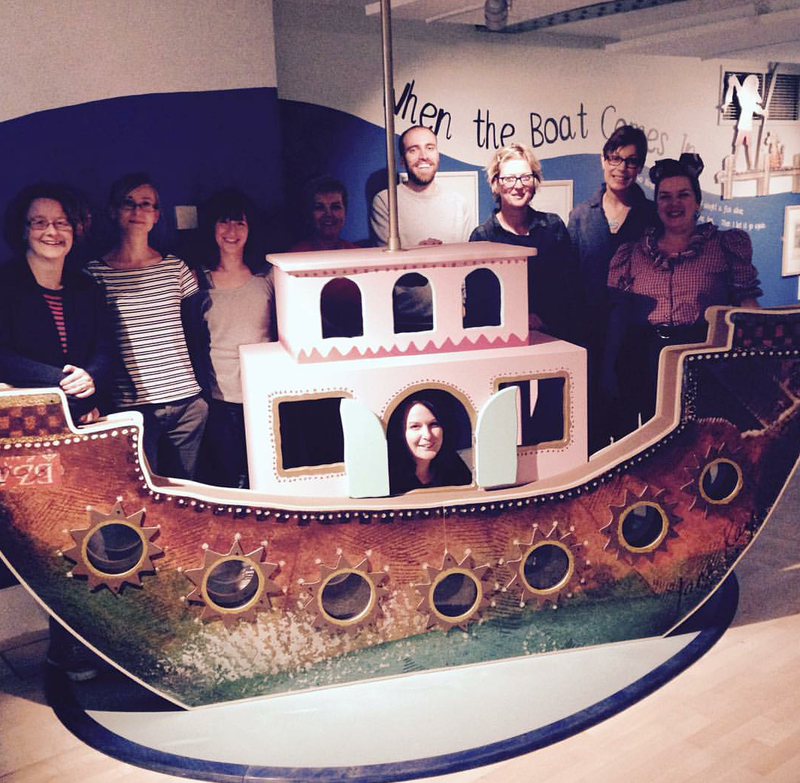 April - June 2015 - For many years, the Collections office has hosted a placement student from the Heritage, Museums and Galleries Studies course at Newcastle University. This year we had the very wonderful Jennifer Patterson working with us for two months. She worked incredibly hard on all the many tasks we gave her in the store, and even got stuck in with exhibition de installation and installation over at the visitor centre. We were very sad to see her leave! June 2015 - One of our biggest achievements this year was installing three new exhibitions in to the newly refurbished visitor centre. Three new exhibitions opened at once, which involved a LOT of behind the scenes work from all the Collections and Exhibitions team - cataloguing, documenting, curating, not to mention the mounting and framing of around 250 works! While the visitor centre was closed, we also were happy to have a few members of staff that usually work there spending time getting to know more about the collection, and helping develop the new exhibitions. 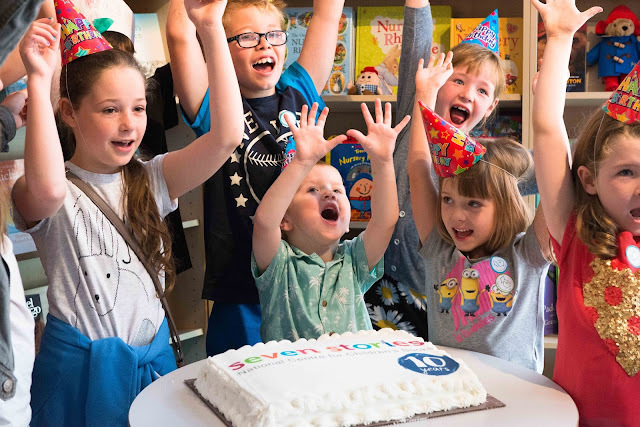 August 2015 - Seven Stories turns 10! During August we celebrated being open to the public for 10 years. Our newly refurbished visitor centre was a brilliant way to celebrate! June 2015 - To coincide with the newly launch Festival of Illustration in Hartlepool, we loaned several illustrations to Hartlepool Art Gallery to join their display. As part of the festival, one of our outreach facilitators, Lynn Telford, worked with 730 participants over 10 days on an associated learning project. Well done Lynn! 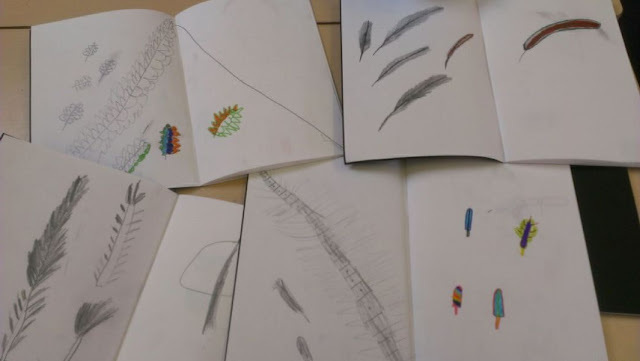 This photo shows some of the children's drawings inspired by our Polly Dunbar artwork. August - September 2015 - We hosted another student, the very wonderful Paula Pintos [third from left], who joined us from the University of Leon, Spain, on an Erasmus placement for 2 months. She worked extensively on both our book and archive collections, including a lot of work on the children's literature reference books, as well as our extensive David Wood archive. Paula is another face that will be greatly missed! Click here to read Paula's post on David Wood. September 2015 - This months saw another new face in our office, Jessica Sage, who has started work as the first EVER literature Knowledge Transfer Partnership in the 40 years the programme has been running. Working hard on our Michael Morpurgo archive at the moment, Jess will be with us for 15 months. September 2015 - The first book to be written on the Seven Stories Collection arrived in advance copy. Here is the author, Sarah Lawrance (Collections and Exhibitions Director) holding it, possibly just a bit nervous to check the final print! 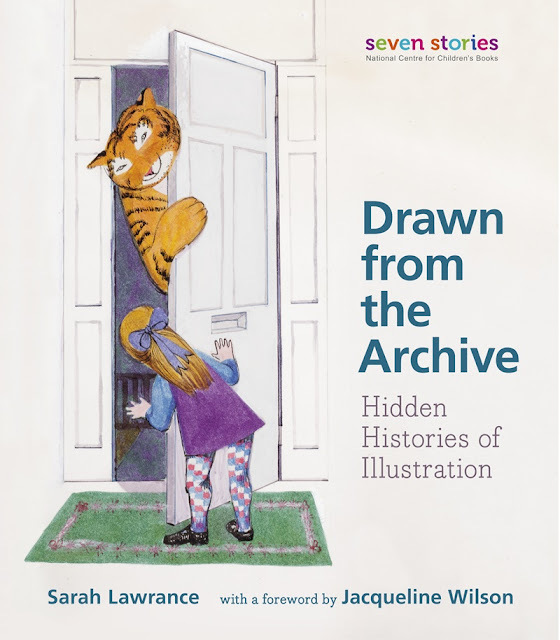 Sarah worked on this book for a long time, pulling together the stories behind many of the collections of illustrations in the archive. Together with her editor, the superb Deirdre McDermott of Walker Books, and help from the team here, it was released to the public in October 2015, and is available to purchase on the Seven Stories website! 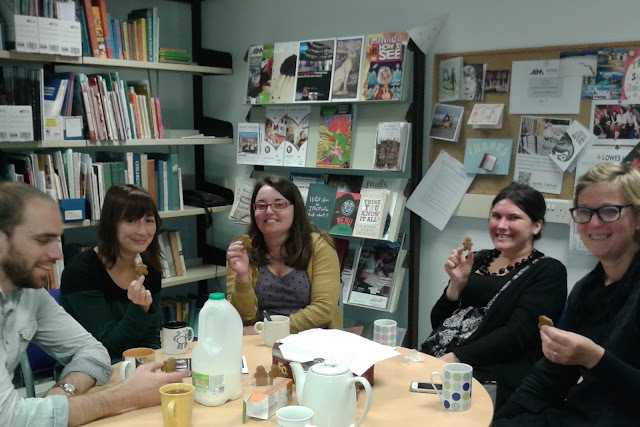 September 2015 - Seven Stories and Newcastle University welcomed Karen Sands-O’Connor as Leverhulme Visiting Fellow for 2015/2016. Karen is Professor of English at Buffalo State College, New York, and specialises in children's literature, twentieth-century British literature, literature about and from the Caribbean, and literary criticism. She is working on a major research project on publishing for a Black British child audience, working extensively with the Seven Stories Collection, and will be giving a series of lectures focusing on this topic. 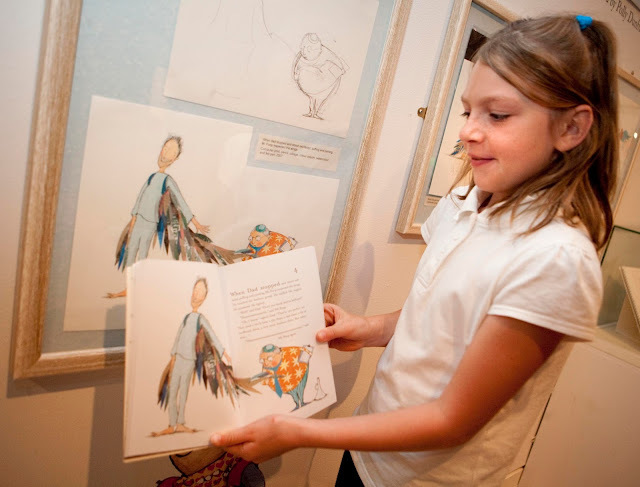 October 2015 - We announced the donation of the Michael Morpurgo Collection in a special event held at Seven Stories visitor centre, just after the AGM. Michael and his wife Clare Morpurgo spoke in conversation with Sarah Lawrance to an enthusiastic and delighted audience. 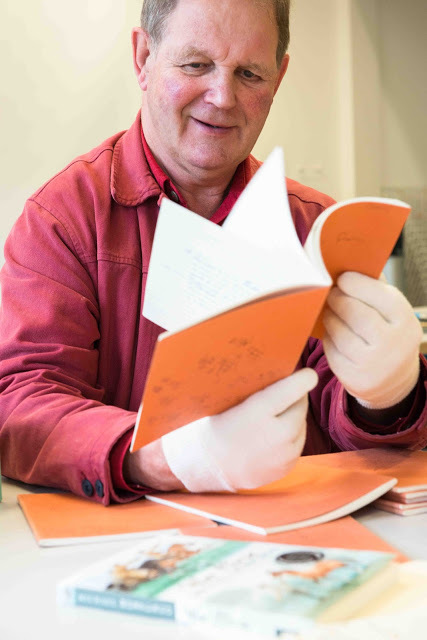 The archive contains manuscripts, typescripts and other papers covering the entire literary career of Morpurgo to date, and will be on public display from July 2016 at Seven Stories, before going on a national tour. Photograph taken by Damien Wootten for Seven Stories. Phew! What a busy 12 months! And of course, don't forget to follow Seven Stories on Twitter and Instagram using the handle @7stories, or on Facebook by searching for 'Seven Stories, National Centre for Children's Books'. 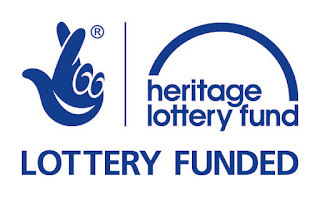 Seven Stories was able to support the acquisition of the Barbara Firth, Clive King, Paul Stickland, Beverley Naidoo, Michael Morpurgo, Elisabeth Beresford and David Fickling archives through support from a Heritage Lottery Fund ‘Collecting Cultures’ grant. 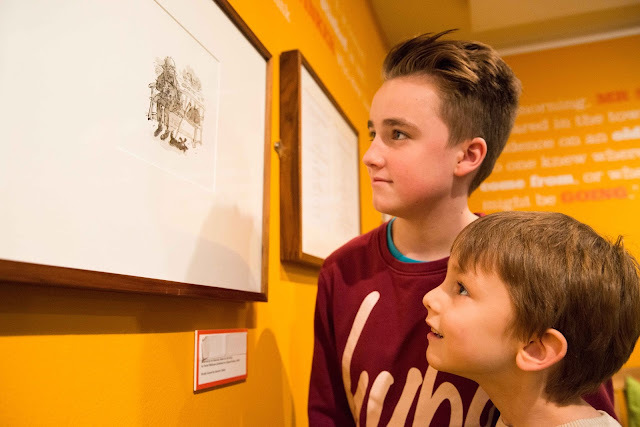 This has been awarded to Seven Stories in recognition of the museum’s national role in telling a comprehensive story of modern British children’s literature. For more information on our HLF Collecting Cultures project see: http://www.sevenstories.org.uk/news/latestnews/hlf. You may have read our recent blog posts by our volunteer, Grace, about foraging for archival treasure in the David Fickling Collection. I thought it would be a nice idea to continue the story. Stuck to the wall above my desk is a postcard of David Fickling. I have no idea where it came from but it was there when I arrived at Seven Stories in February. It shows David Fickling pointing at us readers - ‘Readers: your DFB needs you’. I think this is definite incentive to keep on cataloging: the DFB collection needs me, and our volunteers too. David Fickling is a big name in Children’s literature, he is an editor and his name has lent itself as an imprint for both Scholastic and Random House. But, in 2014 David Fickling Books became an independent publishing house. David seems to be a magnet for talent, he and his team have an eye for spotting amazing books and authors. Many of our collections at Seven Stories are from authors and illustrators which is fantastic but this collection shows another side to the story. It helps to complete the picture, offering us a different insight into how those pencil scribbles, research materials and early drafts develop into neat more complete stories, and how an editor contributes to the creation of the final book that will fill the shelves of bookshops, homes and libraries. David Fickling’s collection represents a large number of author’s work including proof and draft manuscripts, often with editor’s comments. It’s a goldmine of information and presents a great cross section of the industry in representing approximately 75 different writers. As the collection unfolds we’re hoping to find cross over material with some of our other collections. However, we still have a lot of work to do in managing all of this information. I haven't even opened the boxes of correspondence that Grace discussed in her last post. There are currently forty two archive boxes in the David Fickling Collection and as I work through each box the number is steadily increasing. 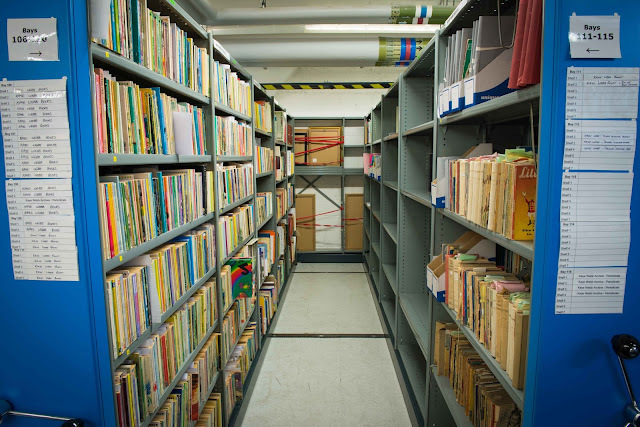 It is vast, and one of our largest collections at Seven Stories. The collection arrived earlier in the year and since then has undergone serval stages of archival processing by two of our wonderful volunteers. Firstly, Grace listed the materials and created a spreadsheet of content so that Kris (our Archivist) and I (the Collections and Exhibitions Assistant) had a better idea of what we had. 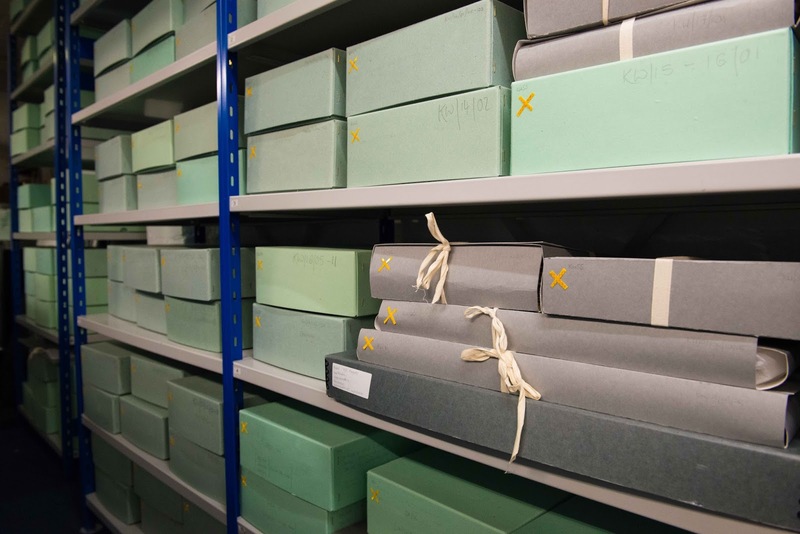 Listing a collection as it arrives makes it easier not only to locate material, but to see patterns of how materials are organised, what themes occur and what types of documents make up the bulk of the collection. This information makes it easier to start thinking about how the final catalogue will be structured. 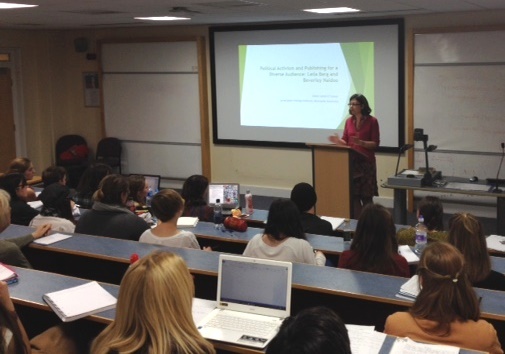 Then Jen came along as a student placement from Newcastle University's International Centre for Cultural and Heritage. She used Grace’s original list to repackage everything. This is a very important stage, the original files and boxes need to be replaced with acid free materials, all corrosive metals are replaced with brass paperclips and the original file labels are recorded. Whilst repackaging Jen also reorganised. She organised all of the files alphabetically by author, and arranged work by each author chronologically. This was a huge task and Jen spent much of her time at Seven Stories surrounded by files and boxes. She also made the next step in processing much easier. Jen had created a structure! All I have to do now is work my way through the lovely neat repackaged boxes and add everything to CALM. 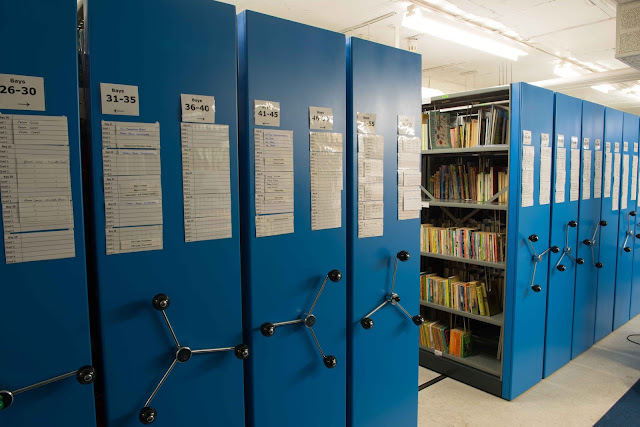 For those of you not familiar with our archive-y terminology CALM (Collections Management for Archives, Libraries and Museums) is a massive database where we record everything that happens to our collections and every exhibition loan that comes through our door. It’s also what we use to catalogue our collections. When we start to catalogue it’s really important that we keep people in mind. 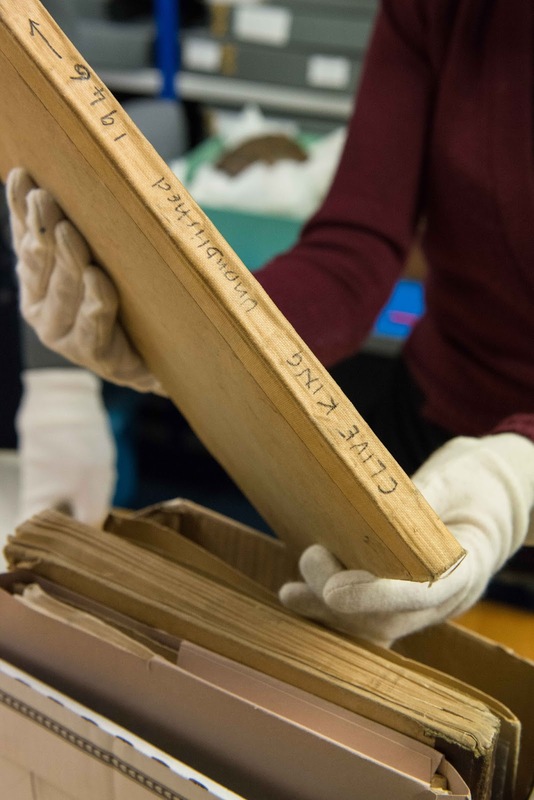 It’s not just us archive-y folk and our volunteers that will use this catalogue but you -the researchers, the academics, and the enthusiasts - and our Seven Stories teams, our curators and our learning and participation team. There are a lot of uses for a collection like David Fickling’s and we need to have an idea of what they are, and what language and structures we need to use to make all of the important information easy to find. 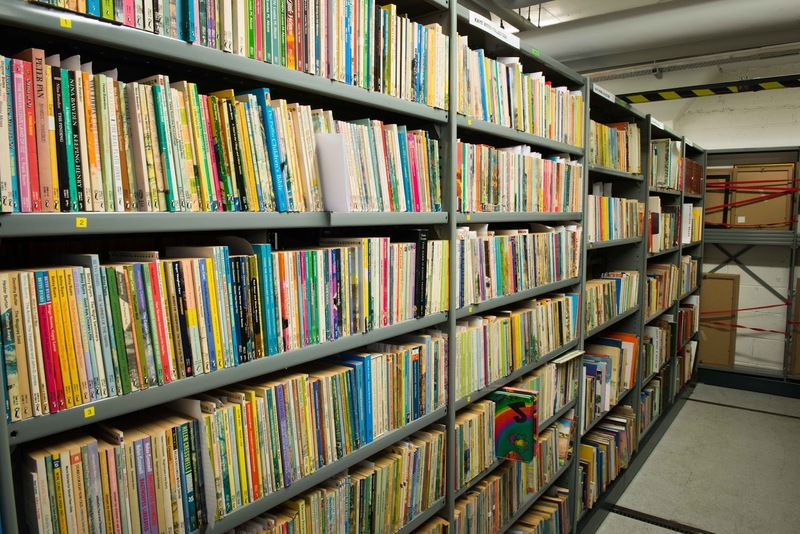 At Seven Stories nothing sits on a shelf for too long. We believe that all of this work created and gathered by incredibly creative people should be shared with other creative people but this has to start with a comprehensive catalogue. So, at the moment I am twenty-five boxes in and working hard. It’s great fun to catalogue a collection like David Fickling’s because there is so much variation between files and though I know what is coming in a very practical sense (thanks to Grace’s listings and Jen’s labelling), there are still fun surprises. When the catalogue is finished it’ll be made available online. However, if there are any interested researchers out there please do get in touch. 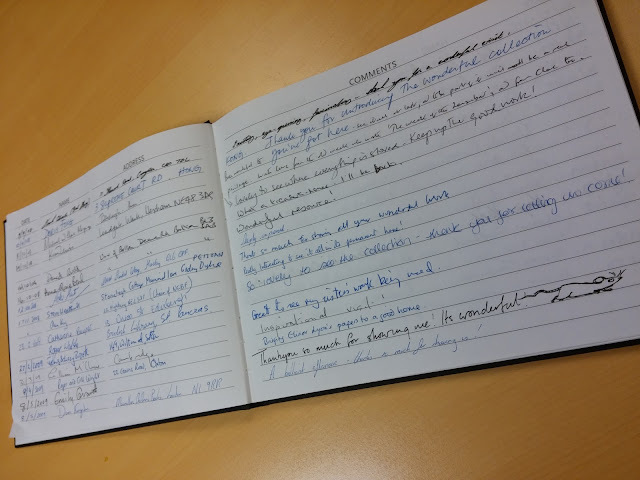 If you’re late to the exploration of the David Fickling collection check out the other diary entries written by our volunteer Grace. Seven Stories was able to support the acquisition from David Fickling through support from a Heritage Lottery Fund ‘Collecting Cultures’ grant, which has been awarded to Seven Stories in recognition of the museum’s national role in telling a comprehensive story of modern British children’s literature. For more information on our HLF Collecting Cultures project see: http://www.sevenstories.org.uk/news/latestnews/hlf.